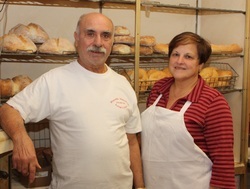 For Maria and Luigi, life began in Italy, in the towns of Ariola and Montesarchio, both outside of Naples. Maria arrived in New York as a young girl in 1956, accompanied by her father, Pasquale Tirino, and her brothers, John and Tony, her mother, Elvira, having arrived 6 months previously. The Tirino family settled in the South End of Albany. Maria attended St Anthony’s School and later Cardinal McCloskey High School, where she earned her commercial diploma, graduating as a stenographer. Maria was employed at the State Bank of Albany, which she left when she and her family returned to Italy on vacation. We leave Maria at this time to catch up with the life of Luigi DeNitto who arrived in New York in 1971. While in Italy, Luigi served in the Italian army and attended college at the Naples State University where he majored in foreign languages, specifically, English, French, and German. His intention was to become a teacher of languages, but somehow love got in the way, love in the name of Maria Tirino. Maria and Luigi communicated for two years through letters. When Maria and her family returned to Italy for a vacation, Luigi met them at the airport. Two weeks later, in August of 1970, they were married by the Justice of the Peace in Airola. Maria returned with her family to Albany and Luigi got called into the army. It was not until April of 1971 that Luigi was able to be reunited with Maria in Albany. On July 3, 1971, they were married at St Anthony’s Church. Luigi initially worked for Fuller Brush Company and then later for a construction firm where he helped build the South End Mall. In 1979 the opportunity arrived for Luigi to purchase Fiorello Importing on Western Avenue. Several years later he requested the help of Maria. Maria left her position as hairdresser to work to develop a successful family business. manager in Fiorello Importing and will eventually take over the business. Anna Rita has earned her master’s degree in Special Education and Secondary Education and is currently working as a kindergarten teacher at Henry Johnson Charter School. Maria maintains deep relationships with her close and extended family and her many friends.